Shipwrecked on the island of Illyria, Viola and her twin brother Sebastian are separated, each fearing the other lost to the sea. Viola disguises herself as a boy and wades into a complex romantic triangle with Duke Orsino and the Countess Olivia. 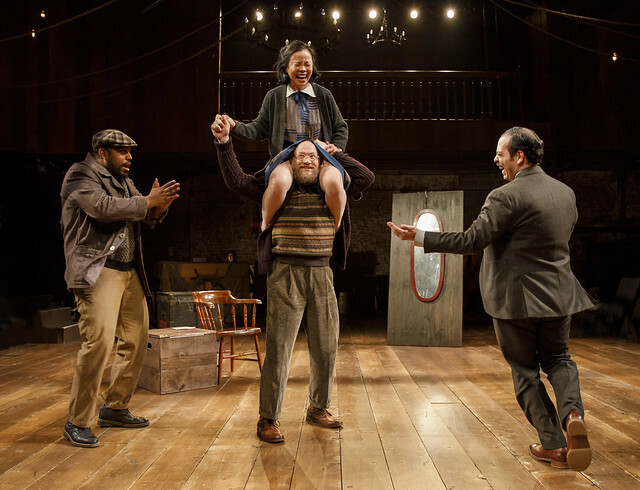 New York’s innovative Fiasco Theater brings their hallmark style and expansive imagination to one of Shakespeare’s funniest and poetic comedies. With Jessie Austrian, Noah Brody, Tina Chilip, Paul L. Coffey, Andy Grotelueschen, Javier Ignacio, David Samuel, Ben Steinfeld, Paco Tolson, Emily Young. Photos by Joan Marcus. Make a tax-deductible gift today.